When we think of online faxing, it’s easy to confuse the process with simple file sharing. Documents sent as attachments in emails doesn’t seem like something all that exciting or useful. But honestly, online faxing is so much more than just sending your colleague a word document to arrive in their email inbox. 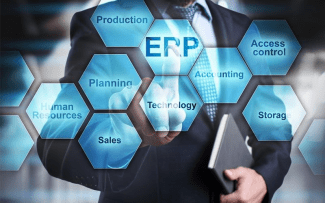 Ignoring the simple fact that the process is actually more complicated than file sharing – online faxing utilizes email to send a document to a receiving fax machine, or allows you to receive a fax as an email, or even text. Its so simple you can even fax right from Gmail, and the added benefits of mobility and ease of use are great and familiar to most, but what about those lesser known features that really help online faxing transform the way you send and share documents? In order to help you make the most out of your online faxing service, we compiled a list of the most useful and lesser known features that can take your productivity to a whole new level. First on our list can arguable be considered one of the most useful features for online faxing, totally filling in a pain point previously felt when sending legal or binding documents that require a signature. Online fax providers that allow for digital signatures are ideal for almost any business, helping you save time and boost productivity by cutting out any unnecessary steps for your faxing process. Digital or electronic signatures allow you to simply add your signature to the electronic document prior to sending the fax on its way to the recipient. 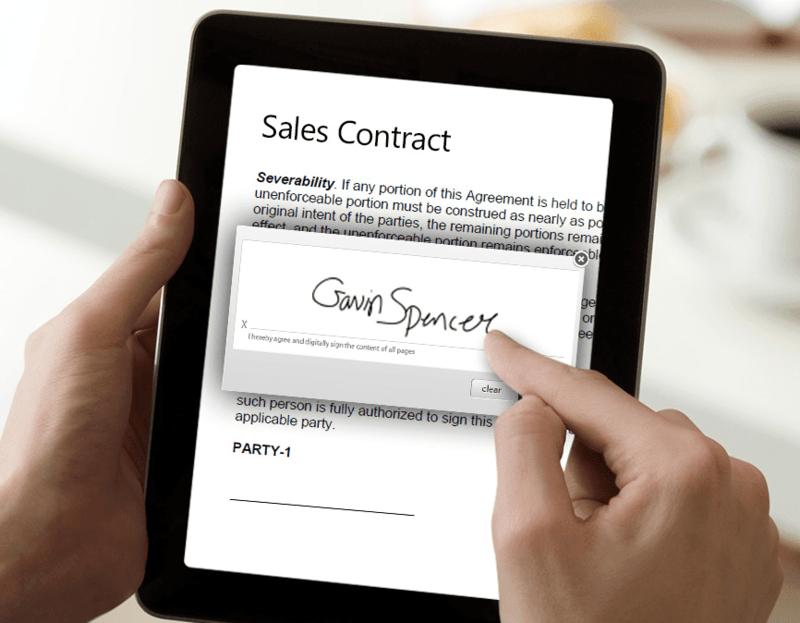 Some services allow for a simple drag and drop of a handwritten signature file right onto the document. This is useful to ensure you have a matching signature on your electronic or hard copy documents – you can upload your own handwritten signature of your choice and reuse the same signature as many times as you need. Another method utilizes the touch screen on your mobile device, allowing you to sign with your finger or even a stylus pen to ensure greater accuracy. The method you choose may depend on your flexibility and access to mobile devices, but the option is certainly one of the most useful features to look for when shopping for an online faxing provider. 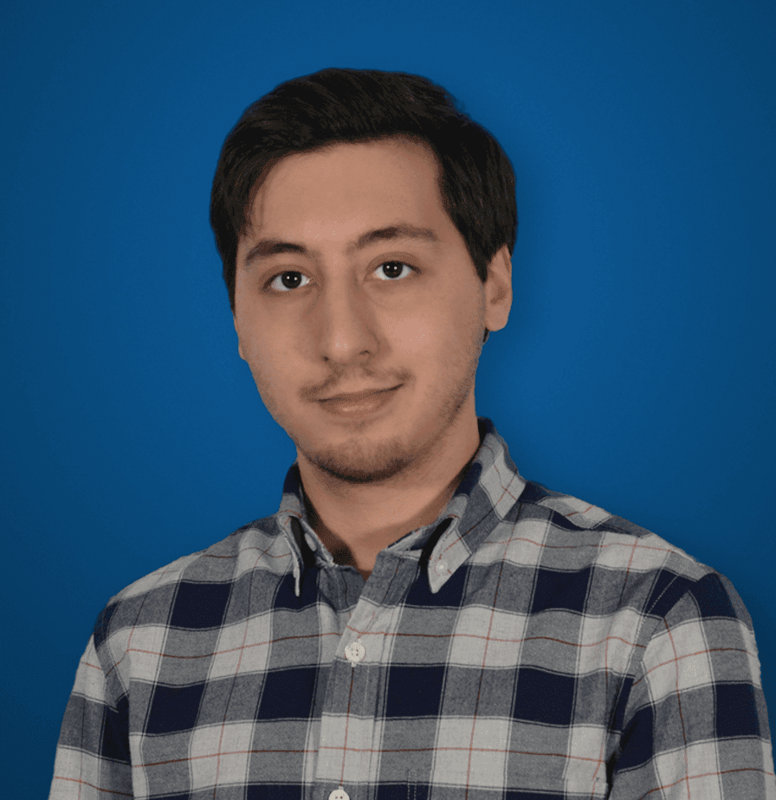 Second on our list is another incredibly useful feature to boost your productivity and cut down on the level of faxing related headaches shared around the office. Sometimes called fax blast, group delivery or bulk faxing, this useful feature is one to look out for when cross shopping internet faxing providers. With group delivery, it can now be possible to send your fax document to large number of recipients, sometimes up to 20 addresses at once, all at the same time. No more are the days of standing in line waiting for your turn as Tina from HR sends out the same fax 50 times, again and again. Fax blasts are now totally possible and ensure each recipient included in the list will receive their copy of the message all at the same time, directly in their email inbox. Now you can improve collaboration and stay focused on your task by ensuring the entire team gets the right message or document right when they need it, where it’s easy to find and organize in their email inbox. 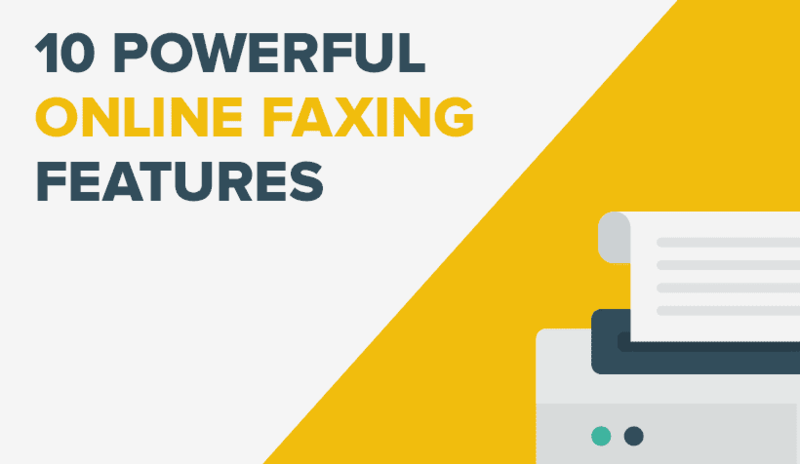 It may seem trivial, but with the introduction of online faxing, one of the pain points associated with standard, traditional fax machines is the need to be right in front of the fax machine at the exact time you need to send over your fax. So if you need to get that important document faxed over first thing in the morning three time zones ahead – when you would normally be sleeping, you would have to not only ensure you’re awake and ready, but you also need to make sure you can find a fax machine! Now, that’s no longer a problem with online faxing. With the ability to schedule the delivery of your outgoing faxes, it is possible to ensure your fax is sent to the right recipient at the right time, whether its instantly or not until after the important closing meeting. 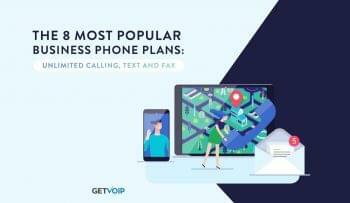 Combine this with the ability to send faxes from your phone or any device with an internet connection, and you cut the strings normally requiring you to have direct access to a fax machine at that crucial moment. Just schedule a fax delivery from your online portal or mobile app and continue with your day with the peace of mind knowing your fax won’t get there too early, or too late. We invited snail mail, and along came the unwanted junk mail. We eventually transitioned to email, and along came the unwanted spam emails. We even get unwanted phone calls clogging our lines up with telemarketing pitches and now even robocalls. 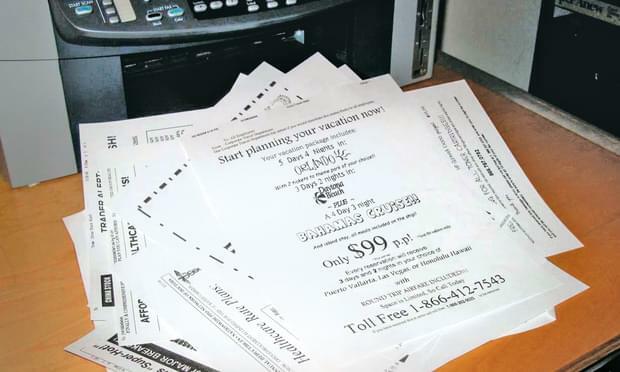 So of course it makes sense that there would be hordes of unwanted junk faxes making their way to your fax machine, or rather with online faxing your email inbox. So like spam filters, that’s where junk fax screening comes in. Junk fax screening actually works in two ways, with a white list and a black list. Utilize the white list to add in approved addresses and numbers to ensure you will only receive documents and messages from these specific numbers, and no one else. However, this can lock down your inbox to only receive messages from those you know, blocking out any new customers or clients. Blacklisting, on the other hand, allows you to input specific addresses and numbers to block from your online faxing service, keeping out those pesky spammers. Some junk fax screening features even allow for a “wildcard” to include a specific area code, numbers sets or prefixes. Cutting down on the spam and clutter will help keep your inbox neat and organized. Ever send out a fax, only to have your recipient waiting and waiting, just for it to never arrive on their end? Not only does online faxing help you stay more organized by keeping a log of sent and received faxes, as well as storing them in your email inbox, but some services can even track your messages as they travel to your recipient. Progress trackers are software that allow you to view the current status of your outgoing faxes in transition, and even follow them every stop of the way from the moment you hit that send button, to the moment they are meant to show up at your recipient’s fax machine or inbox. Progress trackers can help cut down on lost faxes and waiting around to hope that last one will make its way through. 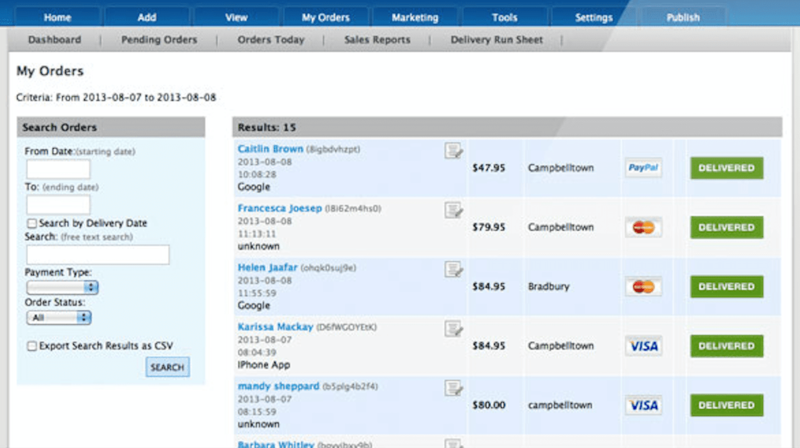 All of our productivity platforms are becoming more and more flexible and customizable. Thanks to the world of APIs, it is now simple for developers to construct bridges between two previously independent workforce solutions. APIs are short, easy to use strings of web-based code that allow two platforms to interact with each other. Just as you can integrate your CRM directly into a team chat tool like Slack, you can easily utilize APIs to integrate your online faxing service directly into any workplace tools your team is already using. 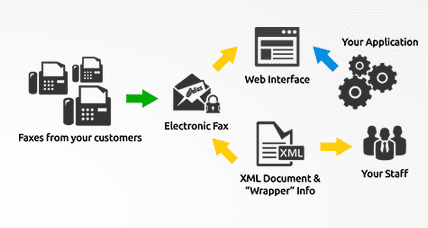 Faxing functionalities can be integrated into any business applications that use SMTP, text XML or web service APIs to automate the process, boost communication and collaboration. Thanks to APIs, the process is simple to add a fax button directly into your CRM, so you can shoot over a client’s profile to your colleague’s fax machine all with the click of just one button. While online faxing is much more than simple file sharing, that doesn’t mean you can’t use the service for file sharing. Online faxing utilizes your email address to send and receive digital documents as faxes either at your own machine, or receiving in your email. However, due to the nature of email it’s very possible you might hit a file size limit when attempting to send a rather large document, or even a completely different file type all together (even videos). Large file sharing is a feature useful for those that need to send rather large or long text documents (think over 100 pages!) 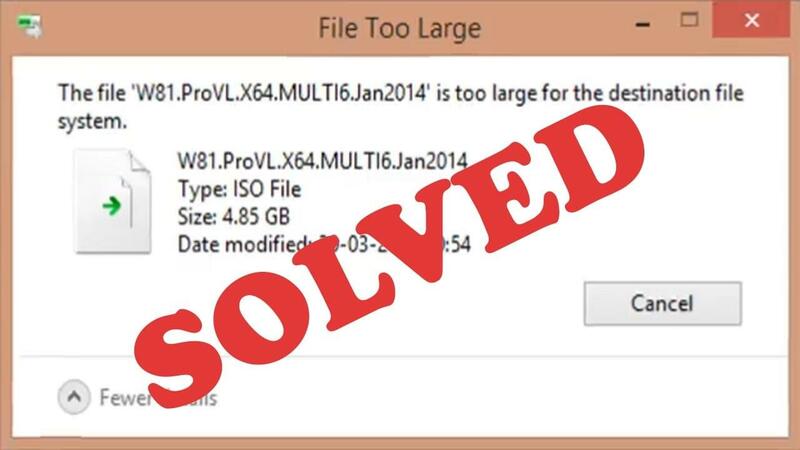 or even completely different file types like high-resolution images, audio files, spreadsheets, and even videos. Online fax providers that allow for large file sharing generally include a cap on the file size, but at 3GB and up this extend way beyond any file limitation put in place by your email service. If your service also includes group delivery, it’s possible to send these large files to more than one recipient at a time as well – something other file sharing platforms may struggle with. Not to be confused with the group delivery of documents, faxing one document to many recipients, made possible with online faxing – one less common feature in online faxing is the ability to link multiple email addresses to one fax line. This way, you won’t have to create a standalone email address to provide to each team member to allow access to your online faxing portal or functionalities. 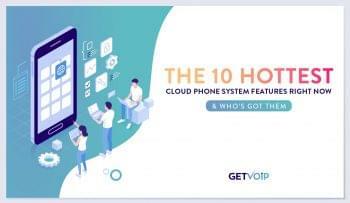 Instead, with multiple email addresses supported, you can include as many individual emails you want to provide access to any and all team members, who will then each receive their own inbox and portal. All while still under one standalone online faxing subscription. 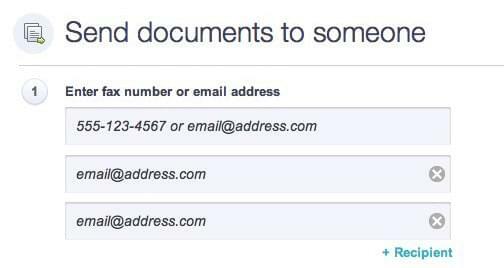 Continuing the cost effective nature of online faxing, adding multiple email addresses to one fax line cuts down on the number of subscriptions or licenses required for your team. With administration controls, it’s easy to stay in control and hand out access to only those that need it, and even possible limit the functionality of individual email addresses that are granted access. Cutting down on the clutter with online faxing isn’t only about less paper, but even less filing cabinets. With everything handled digitally thanks to online faxing, so is your filing. While some providers will have you store everything right in your email inbox, one useful feature to keep an eye out for is the Fax Archive, a dedicated, searchable file storage solution for all of your incoming and outgoing faxes sent and received account wide. Now you can safely delete those old faxes from your inbox and still ensure they will be consolidated in your records just in case you need to recall them at a later time. Some providers will have a limit on the number of faxes you can archive, while others allow for an unlimited number of documents to be stored for as long as you may need. While online faxing inherently increases the security of your documents, only those with access to your email inbox can read your faxes, it is also important to ensure proper encryption is provided for your documents. It can be beneficial when shopping for a provider to ensure not only outbound, but even inbound fax encryption. Some providers will even go so far as to ensure the confirmation of your delivery is encrypted, and allow for hidden destination numbers. If you are in any related industry, it can also be paramount to enlist a provider that ensures compliance with data security regulations such as the American Health Insurance Portability and Accountability Act, as not all providers will go the extra mile. 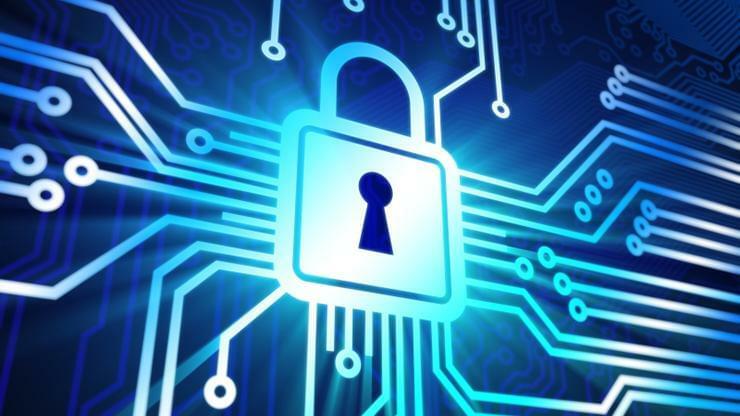 Encryption will usually happen thanks to the standard security technology for normally used for establishing an encrypted link between a client and server – known as SSL, the Secure Sockets Layer. Online faxing alone can help boost productivity around the office, while cutting down on the costs and pain points normally associated with operating a standard fax line, and the dreaded fax machine. But the benefits don’t stop there, with some extra features that are worth keeping an eye out for.